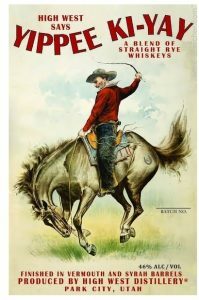 I am more of a straight Kentucky bourbon man, but sometimes I stray and try bourbon’s rye and whiskey cousins – and I simply could not resist checking out Yippee Ki-Yay Whiskey from the fine folks at High West Distillery. Learn more about Yippee Ki-Yay Whiskey from High West Distillery here. See all the fine spirits from High West Distillery here. The fine folks at Gustiamo import great products from Italy, like their line of Italian pastas. Find the Pasta Collection from Gustiamo here. See all the fine imported products from Gustiamo here. When I was a kid I loved smelling the ink in those big fat markers used to write posters and such, and this was way before they came out with scented markers. So yeah, that may explain the loss of brain cells that led to Lost Cowboy. Even today, the first thing I do when I take a cap off of a marker is take a sniff. Now that I am into the adult coloring craze I am using all sorts of colored markers and sniffing my way to relaxation. But now I am totally stoked, because I have found these great Sketch and Sniff Scented Pencils from the fine folks at Always Fits. Did I mention there is a vanilla scented pencil? 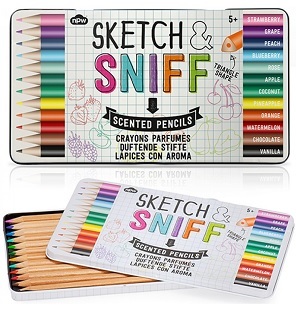 Find the Sketch and Sniff Scented Pencils from Always Fits here. I have been a big fan of Steve McQueen since I was a wee lad. I will admit that my fandom originated with the film The Towering Inferno because as a kid I was really into firemen and he played a fireman so it made sense to love the guy. Of course in the years since, I have come to appreciate Mr. McQueen as an actor, an icon and just the cool cat that he was. I am thrilled that Mr. McQueen has been discovered by subsequent generations and is still celebrated for being, well, so cool. In particular, his passion for motorcycles and his need for speed gets considerable attention, as in the new book McQueen’s Motorcycles: Racing and Riding with the King of Cool by Matt Stone. McQueen’s Motorcycles is a great take for any McQueen fan, or motorcycle fan, but it is also a treat for anyone interested in two cultural phenomena of the last 100 years. 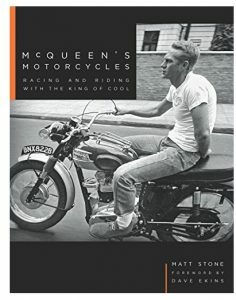 McQueen’s Motorcycles: Racing and Riding with the King of Cool by Matt Stone is available from Amazon and fine booksellers everywhere. 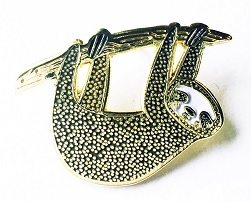 I like pins and broaches, and I simple adore sloths, which is why I fell in love with the Enamel Sloth Pin I found from the fine folks at Gingiber. By the way, did you catch the sloth sequence in the hit film Zootopia from Disney Animation? Seriously, the scene where the DMV is staff by sloths is one of the most inspired and funniest movie bits in recent years. Find the enamel Sloth Pin from Gingiber here. See all the “zest for your nest” from Gingiber here. Nevada-based artist, Anna See has curated a fine online shop with all sorts of items, but it is her own artwork that steals the show. I love her collection of cities prints, which features colorful cityscapes from various cities around the world. 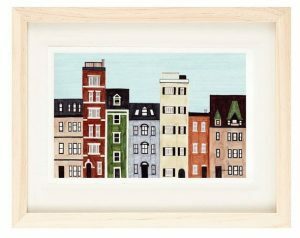 I love her illustration of Boston’s historic townhouses, which helps my homesickness (I lived in Boston for many years in my young adulthood). See Anna See’s entire city collection here. Learn more and visit Anna See’s online shop here. It is a minor miracle that I have not yet been inflicted with Lyme disease as my lifelong friend Lynda has dragged me through tick-infested sea-grass up and down the Atlantic coast for years. However, I have known many people who have not been so fortunate and I have seen firsthand how hard it can be to deal with. The fine folks behind Project Lyme are committed to helping build awareness of the disease and ultimately prevent and reduce new cases. Learn more about Project Lyme and how you can support their efforts here. The challenge of stuttering may not seem to be as big an issue as other causes seeking our attention, but for those who are challenged with this disability it can debilitating. The fine folks at The Stuttering Foundation seeks to raise awareness and find solutions for those challenged with stuttering. Learn more about The Stuttering Foundation and how you can help here. Thomas Jefferson was a lot of things, but he was first and foremost a man of the land. In fact, it has been noted that he grew more than 330 varieties of vegetables in his personal garden at his famed Monticello estate. 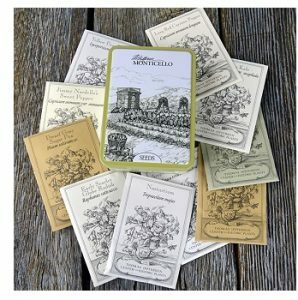 Now you can grow a garden like Jefferson with the collection of Heirloom Seeds from the fine folks at the Thomas Jefferson Center for Historic Plants. Find the Monticello Heirloom Seeds here. Visit the online Monticello shop here. Just in time for setting up my container garden for 2017, I found the Essential Gardener Tool Set from the fine folks at Barebones Living. 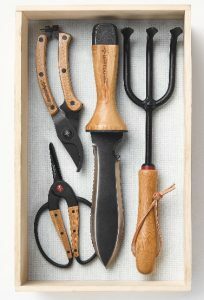 Find the Essential Gardener Tool Set from Barebones Living here. Visit Barebones Living online gardening shop here. You know me, I love a fine charcuterie and all manner of cured meats and related items. 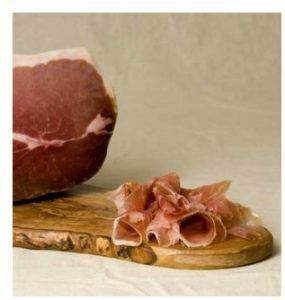 Which is why I love the fine folks at Formaggio Kitchen who offer a nice sampling of their meats and charcuterie in their online store (which also includes cheeses and other great items). By the way, if you ever get to Boston, and you really should get to Boston, you can visit one of Formaggio Kitchen’s three retail locations – in Boston’s trendy South End. Learn more about Formaggio Kitchen and see all their locations here. Check out Formaggio Kitchen’s meats and charcuterie offering here. I have not been everywhere in the world of course, but of the places I have been, Maine’s Mount Desert Island, home of Acadia National Park is the most beautiful. Back in the day I made several pilgrimages to the area and totally fell in love with the place. Of course I am not alone, Acadia is cherished by many others and is again being celebrated as 2016 marked the park’s centennial as a national park. 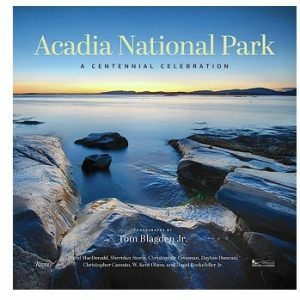 This milestone is commemorated by the wonderful book Acadia National Park – A Centennial Celebration by photographer Tom Blagden, Jr. I love looking at the fine pictures in this book and reliving the great memories of the times I spent in Acadia – and dreaming of visiting again soon. Acadia National Park a Centennial Celebration by Tom Blagden, Jr. is available from Daytrip Society and other fine book retailers. Lost Cowboy is powered by	WordPress 5.0.4 and delivered to you in 0.967 seconds using 58 queries.